Take your business out of the office—and bring it to Stevenson Ridge. Stevenson Ridge makes an ideal location for corporate events of all kinds: retreats, meetings, banquets, and parties. A change of scenery might be just what you need to refresh your corporate batteries and jumpstart those creative juices. For retreats and meetings, our morning coffee service can help generate buzz for your discussions. 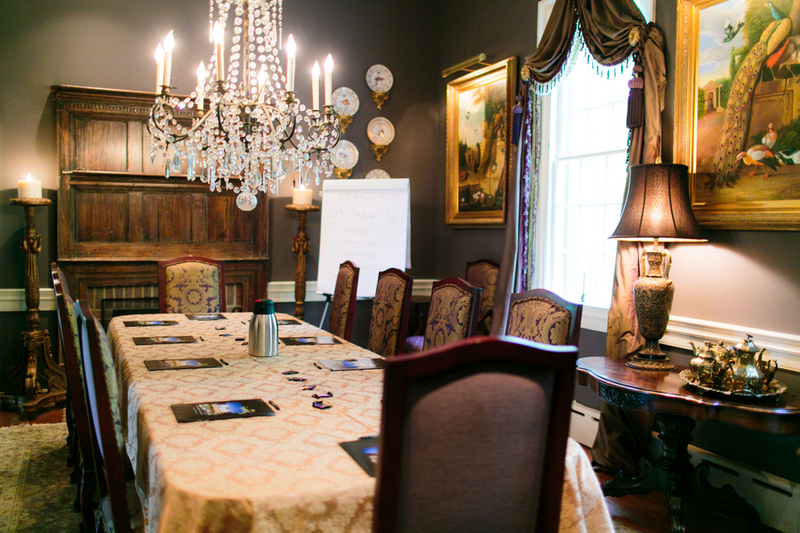 We have larger rooms for group brainstorming sessions and smaller spaces for breakout discussions. Our catering staff can help you with lunch, and we’ll make sure you have drinks and snacks available throughout the day for those times when you need a quick bit of brain food. We also have audio-visual equipment, including a projector and screen, speakers, and microphones. You might also consider taking advantage of our on-site lodging for overnight retreats or out-of-town guests. For Corporate Events, the Riddick House makes an ideal location for smaller, intimate gatherings, while the Lodge accommodates groups up to 220 guests. Our customized catering and bar packages will ensure a good time will be had by all. Weekday rates start at $700 for the Lodge and $325 for the Riddick House.